Selected Iris tubes installed in Hamar and Ulen soils at Sheyenne National Grassland in Ransom County, ND; Winger and Colvin soils at Hamden Slough National Wildlife Refuge in Becker County, MN; and a Giese soil in St. Louis County, MN. 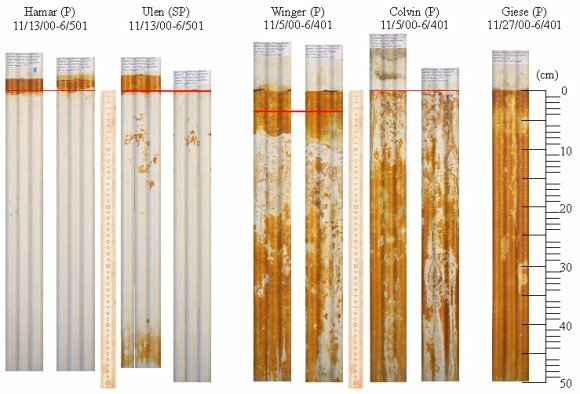 Depth to anaerobic microbial reduction of Fe is indicated by horizontal red line on each tube. Red line represents the soil surface. IRIS tubes can be placed in the field at any time of year provided the ground is not frozen. At minimum, pairs of tubes should be installed at any place tests are made. Leave the IRIS tubes in the ground two weeks or more. Bore as many holes as needed with a 3/4” soil probe, to a depth of 20” (50 cm). If the soil is saturated or moist the tube is simply pushed into the hole by hand until the tube is seated at the bottom. If the IRIS device is to be installed in dry soil material, fill the hole with water and wait for a few moments to let the water soak in, and then install the tubes. In coarse textured or gravely soil, a bucket auger or spade can be used to dig the hole.Insert IRIS tube so that 1/2'” of oxide coating shows above ground level. Backfill hole as needed and tamp earth lightly around top of tube. The time it takes for ferrihydrite to be removed from IRIS tubes depends onwhen during the saturation-reduction process the tubes were installed. If they were installed when the horizon first became saturated, typically during the growing season, the removal time is around two to six weeks. If they were installed at the time of most active reduction, typically April, the removal time could be as short as one week. When no water table is present, the ferrihydrite coating will not be affected or affected very little. To retrieve the device from saturated or moist soils: gently wiggle the tube to see how tightly the soil holds onto it. Typically, if the device wiggles easily the tube can be removed by pulling it straight out of the ground by hand or with the use of pliers. If the soil holds the tube tightly use a spade to cut the soil on each side of the tube and wiggle the spade back and forth to make a wedge-shaped opening on each side. IRIS devices respond to changes in the redox state of the soil. The soil is saturated and anaerobic when the coating dissolves. Degrees of mottling of the coating mimic the morphology of the soil due to the duration of saturation. When most of the coating is dissolved, the soil is significantly anaerobic. When the coating has a mottled or splotchy pattern, the soil is moderately anaerobic. When the coating does not change, the soil is aerobic.